The Bristol / Bath area is famous for many historical trades such as architecture, ship building and its aircraft industry. However, it is often forgotten that our locality has a long tradition of musical instrument manufacturing. The first organ builder to have his works in Bristol was Robert Tanton, establishing his business in 1660 and so followed a succession of organ builders, including manufacturers and hirers of barrel organs and pianos etc, dealers and shops selling all kinds of instruments, both mechanical and manual players. By the middle of the 18th century, the area could boast such famous firms as Elizabeth Chew, the Bristol Harpsichord makers, and Brice Seede Organ Builders. As the music industry grew, apprentices to these firms started their own businesses like John Smith of Bath and Bristol who trained with Seede and was succeeded by his son, Richard Smith, who in turn was succeeded by Joseph Monday. One of the areas closely linked to the music industry was Castle Street in Bristol, which at one time could boast music box sales, pipe organ dealers & manufacturers and other musical instrument shops. By circa 1800 the famous cabinet making family of Hicks had turned their attention to the building of musical instruments and are credited as inventing and building the very first street barrel piano in Bristol around this date. So by 1816 the firm of Joseph Hicks was well established as a leading supplier of barrel street pianos and organs exporting them worldwide. The Hicks pattern of street piano was so popular that other firms copied the design, including the German builders of the Black Forest area. Following the success of the Hicks street piano, Hicks style pianos continued to be built in Bristol by his ex apprentices. At this point the firms of Henry Distin and Taylors were established and continued the tradition, although Henry Distin emigrated to America, leaving Taylors the English market. Not only were pipe and string instruments popular, also reed playing organs were sought after. 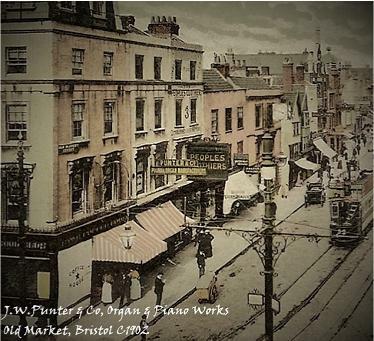 Bristol was not to be left behind in this field, with George B Briffett establishing his reed organ manufacturing business in Hulbert Street circa 1883, producing fine quality reed organs. In The Same year John William Punter and Co, who also traded as The Bristol Organ Co. manufacturing reed organs and pianos set up in old Market Street they also had a factory at Staple Hill, They were to become the largest manufacturers in the West of England. By 1909 music businesses were well established in the area and it was in this year that Arthur Oram was to found the Bristol Showmen's Stores in Bedminster which went on to become sole agent for the Paris firm of fair organ builders, C H Marenghi & Cie. Today this historic name can still be seen as the brand / trade name on some of the products and organ music supplied by Dean Organ Builders the last remaining Bristol family business still repairing and building mechanical organs. 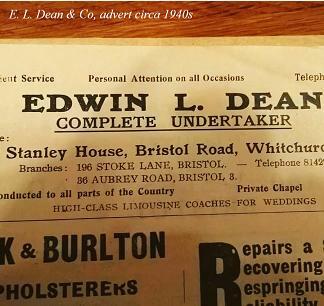 The Dean Family Business in Whitchurch grew out of the business which was started by Mr Edwin Dean in Circa 1929. E. L. Dean & Co.
Edwin Dean was born in 1907 the son of Walter Dean. The Dean family have a long tradition in woodwork, carpentry and cabinet making dating back to the early 19th century and Edwin's father followed that tradition working as a coach builder and motor machinist working first on coach work and later in the new automobile industry, constructing wooden bodies. It was from his father W.T.Dean, that Edwin was to learn his cabinet and woodworking skills. 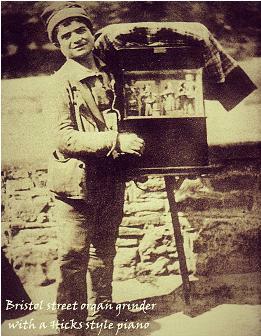 The late 1920s and early 1930s were to see one of the worst depressions to hit England with more than 3 million out of work nationally and it was against this backdrop that Edwin was to start his business, he was from an early age an astute business man and he was not adverse to trying his hand at any type of work to make his living. Edwin's first business premises was in Bedminster and from here he would run initially a dairy and his wood working contract business, Edwin's mother's family had farms in the Harptree area.Starting a dairy buisness in Bedmister supplying milk and eggs, would give a good constant mornings work, after all everybody needed milk in those days, and once the mornings work was finished this would leave time for his other contracts. The business flourished and soon Edwin started to gain woodworking contracts, but not content to just sit back he was keen to expend his horizons and as was so often the case with carpenters in those days the idea of becoming a funeral director and making coffins was to appeal, after all you are never short of customers in that trade! As his business expanded he required more room so in the 1930s Edwin and his wife Vera moved both home and business to Whitchurch and so established the present site where our retail shop and workshops are to this day. Over the years, a business cannot stand still if it is to survive the test of time, it must adapt and take advantage of changing fashions and so our family business has at times changed course during that evolution. We have been involved in the dairy industry, woodworking, carpentry and cabinet making, undertakers, funeral supplies, monumental masonry, buying and selling, harmoniums & chapel organs, limousine hire, vehicle garaging and insurance, handy man stores, general builders, engineering, musical instruments, music boxes and organ building. The one occupation that has consistently remained through the years has always been the family tradition of cabinet making and wood working. 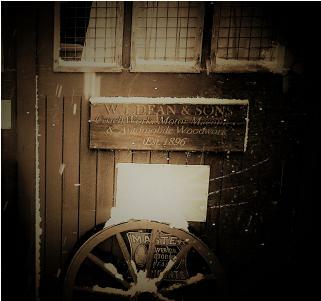 Michael Dean, Edwin Dean's son followed in that tradition learning the skills of wood working at an early age, first earning pocket money making boxes for company contracts and later progressing to coffin manufacture and cabinet making. Whilst at school Michael (Mike) studied piano and built his first organ a small manual instrument. In the 1950s Mike met and became friends with organist and organ builder Dennis Chappell. 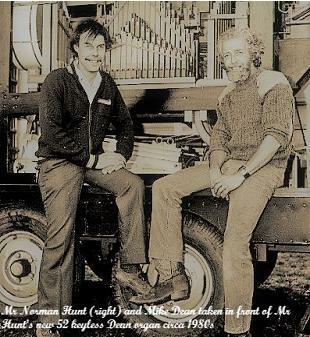 Mike shared Dennis's enthusiasm for organs, and was to help Denis restore a Gasparini Fair Organ which they would take to local steam rallies along with Dennis's showman's Steam engine. It was this first taste of fair organ building that lead to a lifelong passion for mechanical music. 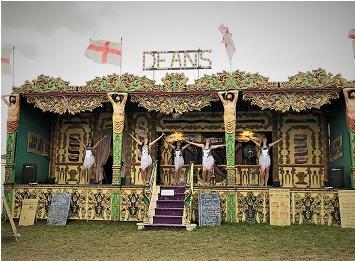 It was under the direction of Mike Dean circa 1970, that the company would turn its woodworking business full time to the building of new traditional style fairground and street organs alongside restoration and repair. At first the firm traded as "M.C.Dean, Fair Organs Designed and Built" later Dean Organs and then as it is known today Dean Organ Builders. The family are responsible for a number of innovations taken as standard today, such as the introduction of the 20 keyless book playing organ and the English style 52 keyless book playing organ. Mike and Pat Dean were joined by son Richard in the 1980s having trained as a production engineer. Richard then went on to do an apprenticeship under his father Mike, becoming a partner in the business in 1989. The company has produced a large number of new organs which can be seen all over the country at steam fairs etc. Following Mike and Pat Dean's retirement from the business in the late 1990s, the organ building business continued and Richard Dean became the senior managing partner. 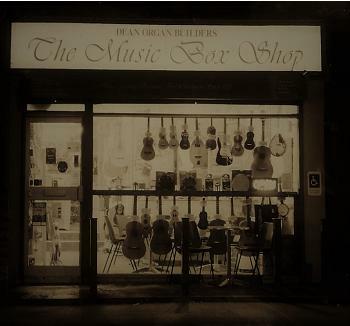 It was during the late 1990s that the business opened the retail music shop, "The Music Box Shop", which was established to sell high quality new music boxes and musical jewellery boxes together with all kinds of musical instruments such as acoustic and electric guitars, violins, banjos and musical accessories. For those who were unable to visit the shop the business set up it's online store circa 1999. Giving customers the ability to purchase general musical instruments, high quality music boxes, musical gifts and a range of musical jewellery boxes direct for home delivery. The latest online version of our store www.shop4musicboxes.co.uk was recently updated in 2018 to cater for the increased level of online shopping. Over the years the business has acquired a large archive of historic organ information and built up the equipment and tools needed for this unique trade with some of the tools coming from old firms. One such firm, who for historic reasons should be mentioned, is Pasquale & Co, Highgate, London, established 1860. Following the death of Richard Chenley who was sole proprietor, Dean Organ Builders Purchased the remaining instruments and records. When Duck Son & Pinker closed the famous Bath Music Store, Dean Organ Builders purchased their websites, so this famous name could continue. We also purchased musical stock and all the tools and contents of the repair shop from the Receivers to add to our own extensive repair works. In January of 2006 the business opened a music tuition office for keyboard and piano and in 2014 we added a small coffee shop within "The Music Box Shop" and these have complimented the services that the company offers. Whatever aspect of music you are interested in, whether it is mechanical organs, music boxes, or acoustic guitar you can be sure whether you purchase a Dean made product or an externally sourced product, that the same care and pride has been used to manufacture or source it as is expected of a traditional firm. Today the business continues in the hands of Richard, Sue & Tom Dean. Richard and Tom continue with the organ building and music book manufacturing, their knowledge and expertise is often called upon by specialist collectors from all over the world and they have a full order book which includes new organ projects and restorations. Sue is the manager of "The Music Box Shop", with her friendly and helpful staff they are always on hand to offer advice on your music box or musical instrument purchase and to ensure that your order arrives promptly if purchased by mail order, or if you are visiting the retail shop that your visit is a pleasant one. "Dean Organ Builders, keeping The Tradition of Mechanical Music alive". Mechanical Pipe Organ Builders, Tuners And Consultants.